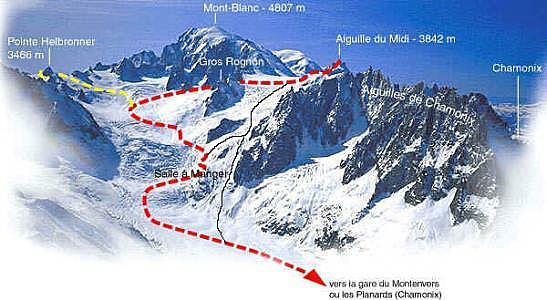 Skiing the Vallee Blanche (white valley) is the best experience of skiing in the highest mountains of the Alps. Take care, this itinerary is almost entirely on the glaciers with crevasses covered by snowbridges in altitude. This great route starts from Aiguille du Midi (3842 meters high) which is the highest cable car in Europ and ends in Chamonix at the altitude 1000 meters. : the Valley Blanche is not a slope, but a real off piste route with involved dangers by the wild environment: the crevasses, the route searching and the avalanches. The scenary is amazing, the snow and glaciers landscape gives a unforgetable sensation of wilderness. This a dream that all skiers dream to achieve. When the snow conditions are good, the intemediate skiers can be able to descend this fantastic route (the minimal level is to have a solid red level on bumpy trails and to control your turns even slowly for staying on the track if there are crevasses around you). However it will be better and safer if you have a previous off piste experience (even close to the slopes), being an all snow skier is a good advantage for this experience. VALLEE BLANCHE WITH A GUIDE? If you have no high mountain experience, we recommand highly to hire a guide which is the professionnal specialist of skiing on glacier. This not a question of skiing level, but a question of safey: the Vallee Blanche is a totally different environment compared to the traditionnal skiing in the resorts. Skiing on a big glacier involves dangers and a mountain guide is very useful for reducing them.